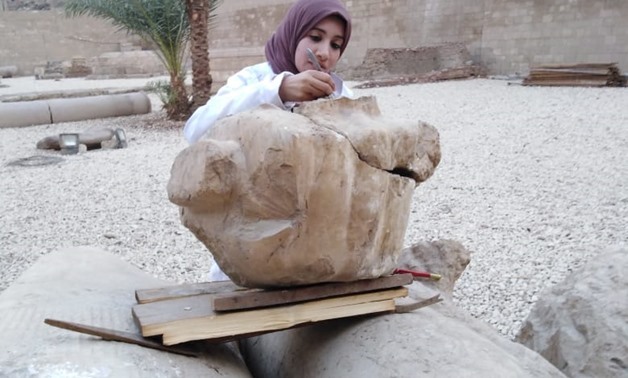 CAIRO - 7 February 2019: The Ministry of Antiquities started restoring Ramses II statue in Akhmim, Sohag governorate, as part of the ministry's efforts to put Sohag on the map of international tourism, especially after opening Sohag National Museum in 2018. Secretary General of the Supreme Council of Antiquities Mustafa Waziri clarified that the restoration process will include cleaning, archiving and re-assembling the statue before relocating it in its original place next to the statue of Queen Merit Amon in Akhmim. The original height of the statue is 15 meters and it weighs about 45 tons. It is noteworthy that Sohag boasts many important monuments, and Akhmim is the capital of the ninth dynasty of Upper Egypt. The ancient city of Akhmim is located in the eastern part of the Nile in Sohag governorate and includes a temple of King Ramses II and his daughter Merit Amon.